I want to call your attention to the highlighted part of the picture, which was very blurry in the original. I used photo-editing software (Affinity Photo, if you're interested) to sharpen and highlight it. The damage to the pipe insulation in the foreground is serious because it reduces the air-conditioner's efficiency, but it's also simple and inexpensive to fix. The more serious problem is the damage the rats did to the flexible HVAC duct. 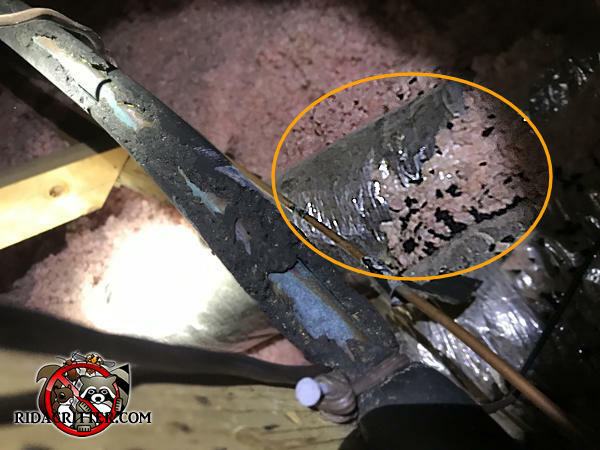 Not only is it more expensive to replace, but had they gotten inside the duct, they could have done very serious damage to the air-conditioner and furnace (aside from spreading filth through the whole house).